Merkato is an easy-to-implement CPQ configurator for businesses of various sizes that promises more sales power and ROI by putting knowledge at the fingertips of users. It makes it easier for users to evaluate alternatives, eliminate errors and reduce cost of sales by providing them with rich documentation and quick insights into changes. It allows businesses to capture and share knowledge and provides intelligent feedback for up-selling and cross-selling. Being an easy-to-implement solution, Merkato reduces the time to quote, automates workflows and seamlessly ties into the existing systems, which ultimately results in happier teams and customers. It’s a simple, yet comprehensive system that allows capturing business rules and generating quotes as well as other documents related to products. Web-based deployment means better flexibility as even the management modules can work without any client-desktop system, while users can also opt for on-premise solution if they are willing to pay for each license separately. The clean and intuitive user interface is backed by a sophisticated sales configurator that helps sales reps to create accurate quotes in less time. Partners, vendors and customers can provide feedback about what they really want, while the system provides suggestions and recommendations based on their feedback. It automatically calculates financial and technical outcomes based on the feedback, which helps users come up with better and optimized pricing. Generating a quote becomes easier once all the relevant information is available and customer’s needs have been successfully translated into specific solutions. The CPQ only displays relevant questions that users really need to see when configuring, while the user interface adopts according to customer’s response and feedback. This ensures that the system only displays options that are valid and within the commercial and technical capabilities. Users can easily attach more information as drawings and additional specifications. Users have to put information into the CPQ once after which it makes it available for all authorized users. This allows partners, sales teams and vendors to focus more on selling and creating a long-lasting relationship with the customers. The CPQ takes all the important variables into account while calculating, including commercial and technical implications. It takes into consideration the important factors other than just price and quantity such as engine power, assembly hours, discounts, available resources, mass, transportation, exchange rates and more. The real-time calculations ensure consistent and accurate quotes and help prevent miscalculation and confusion at the customer’s end. 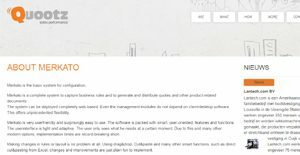 If you are interested in Merkato Configurator it could also be beneficial to examine other subcategories of Best CPQ Software collected in our database of B2B software reviews. Companies have unique wants and requirements and no software solution can be just right in such a scenario. It is futile to try to find an ideal out-of-the-box software product that fulfills all your business needs. The wise thing to do would be to adapt the system for your unique needs, employee skill levels, finances, and other elements. For these reasons, do not hasten and invest in well-publicized popular solutions. Though these may be widely used, they may not be the best fit for your specific requirements. Do your research, investigate each short-listed application in detail, read a few Merkato Configurator reviews, speak to the maker for explanations, and finally choose the product that provides what you require. How Much Does Merkato Configurator Cost? Enterprise pricing details are available upon request from the vendor. We realize that when you make a decision to buy CPQ Software it’s important not only to see how experts evaluate it in their reviews, but also to find out if the real people and companies that buy it are actually satisfied with the product. That’s why we’ve created our behavior-based Customer Satisfaction Algorithm™ that gathers customer reviews, comments and Merkato Configurator reviews across a wide range of social media sites. The data is then presented in an easy to digest form showing how many people had positive and negative experience with Merkato Configurator. With that information at hand you should be equipped to make an informed buying decision that you won’t regret. What are Merkato Configurator pricing details? What integrations are available for Merkato Configurator? Merkato Configurator integrates with the following business systems and applications. If you need more information about Merkato Configurator or you simply have a question let us know what you need and we’ll forward your request directly to the vendor.